After months of delays, the wheelchair path near the Redemptorist Vocational School for Persons with Disabilities is nearly done, but students can’t use it because neighbors continue to park their cars on the raised route. City hall officials say the paved wheelchair path running down to Big C Extra along Soi Paniad Chang now is 90 percent complete. 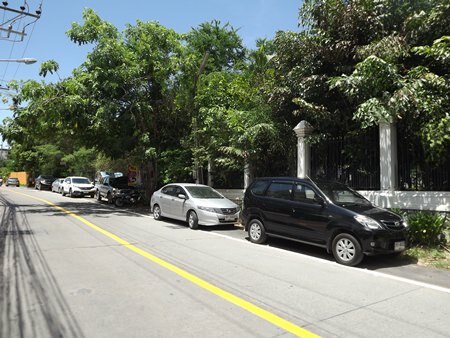 Most of the route, which sits four centimeters above the road surface, has been paved with decorative bricks laid near the entrances of the Redemptorist and Tantarak schools. Most of the road is now safe to travel along – but then there are areas where it is not so safe. 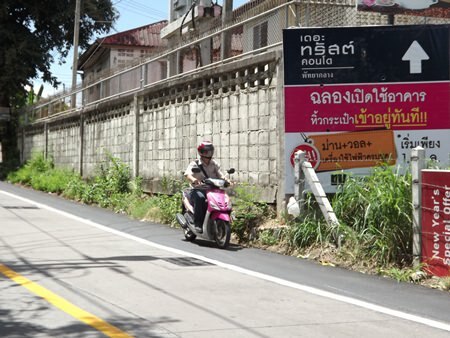 Redemptorist electronics teacher Jetsada Khunpol said staff and students were pleased to see Pattaya create the path for students, but were very dismayed at the lack of courtesy shown by neighbors on Soi Paniad Chang. Despite the fact the route is raised above the roadway to show that it is a dedicated path for wheelchair users, residents continue to park their cars on it and local businesses have piled items on the path, blocking access for the intended users. School officials want city hall to paint the path with wheelchair symbols and place signs along the route to better educate local residents. They also want police to better police the route to ticket cars parking illegally on the path. Ironically, such problems were expected during the early stages of planning for the wheelchair path. Original plans called for the path to be separated from traffic by a barrier. City hall cut costs, however, by choosing to demark the route with merely by a painted line. 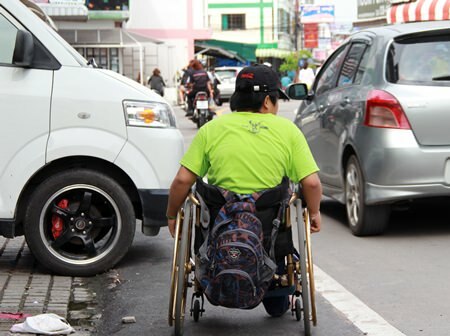 For the students attending the Vocational School for People with Disabilities, which is located on Soi Paniad Chang, also known as Soi Yume, traveling along the highways and byways of Pattaya has never been an easy task. 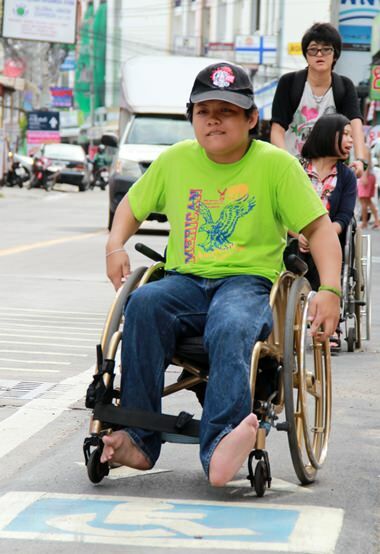 It is not just the students who have difficulty, but also local residents who are living with a disability and the elderly who use support frames to mobilize. Not everyone has taken notice of the new road rules. 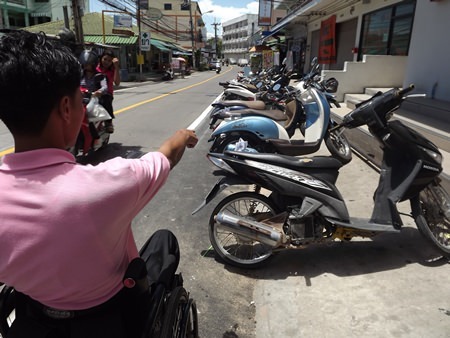 A build up of heavy traffic over recent years along the soi has resulted in an increase in accidents between cars or motorbikes and wheelchairs, including one recent fatality. 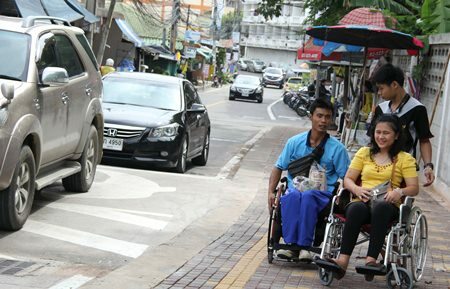 Thanks to a multi-million baht initiative by City Hall, life is now safer for the students. A designated lane for the disabled has been laid, complete with blue signs informing the public what the new lane is to be used for. Raised areas have been built across the road in several places, in an attempt to prevent speeding, keep the traffic at a safe speed and also provide a protected place for wheelchair users to cross. School officials want city hall to paint the path with wheelchair symbols and place signs along the route to better educate local residents. They also want police to better police the route to ticket cars and motorcycles parking illegally on the path. Unfortunately, no matter how many brightly painted signs are laid on the new black lane, there are those who completely ignore the new rules of the road. 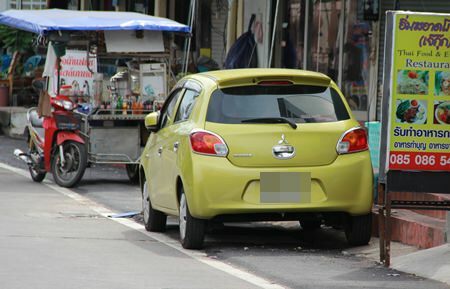 Cars, delivery vans, motorbikes and food carts continue to be parked on the new lane, and in the way of those who need to use it and putting them at risk of harm. 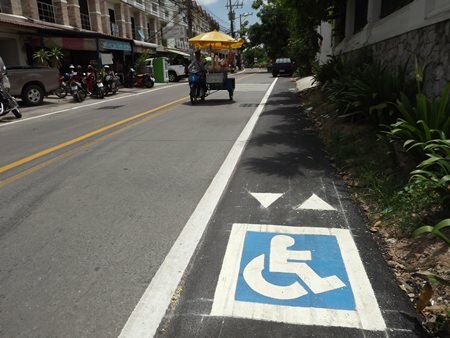 Engineers recently painted a wheelchair access sign along the route. Several raised areas will slow the traffic along Soi Yume. Cars were found parking in the wheelchair path just a short distance from the foundation. Driving in the wheelchair lane is also illegal. The new lane offers safety to the students with disabilities. 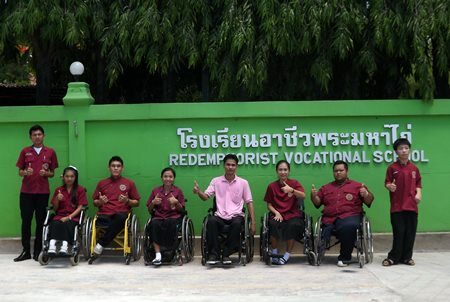 Teachers and students from Redemptorist School thanking Pattaya City. 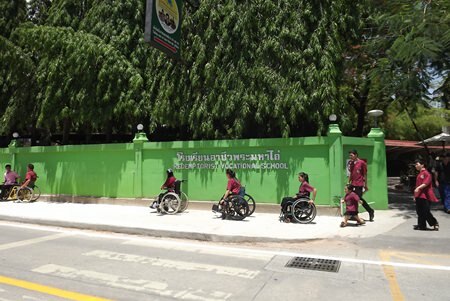 Teachers and students from Redemptorist School begin testing the new wheelchair route.